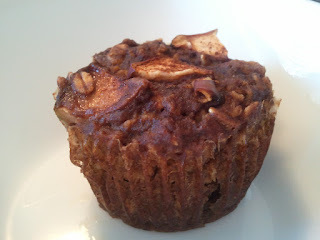 This week Angelique Kronebusch over at MuscleBombshell.com posted a great recipe for Apple Protein Muffins. I loved that it was a super easy recipe with a short list of ingredients that I already had lying around the house. I made modified version yesterday by adding a few extra ingredients, and by accident, I doubled the egg white amount (not sure what I was thinking when I picked up the 1 cup measuring scoop thinking it was a 1/2 cup). I was scared that the muffins were going to be too fluffy because of the extra egg white, but they actually came out really delicious! So here is my Apple Protein Muffin recipe inspired by MuscleBombshell...Thank Angelique! Nutritional info for two muffins: Fat: 1.75g Calories: 136g Carb: 17g Protein: 12g Sugar: 5g *The nutritional breakdown is an estimate based on the specific ingredients that I use in my recipes. The breakdown for your recipe may vary slightly depending on the ingredients that are used. Preheat oven to 350°F. Mix all dry ingredients in a bowl together, then mix in remaining wet ingredients and apple slices, except for a about 12 slices to add to the top of muffins. Prepare a 12 cup muffin pan with paper or foil liners. Spoon equal amounts of muffin mix into each liner. 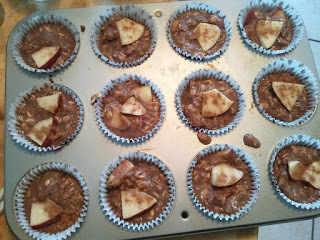 Place remaining apple slices on the top of the muffins and sprinkle with a little extra cinnamon. Cook muffins for 25-30 minutes. Let them cool enough to handle and remove liners. Once they have all finished cooling completely, place in snack baggies and refrigerate. Bon Appétit! Want recipes, meal ideas, inspiration, free goodies and more? Then sign up for my monthly newsletter and also connect with me on Facebook,Instagram, Twitter, YouTube and Pinterest!